There are a vast number of styles and combinations, giving you lots of choices for the look of your stairway. Stairs can be a challenging project, whether you are a contractor or a do-it-yourself person. There are a vast number of styles and combinations, giving you lots of choices for the look of your stairway. We only stock a few select, popular styles, but we can order a great many other styles. OVER THE POST: The over the post rail system gets its name from the obvious fact that the railing is attached to the posts by drilling into the underside of the railing. The baluster system may be of either sort, though the most common one used with the over the post style is the one where the balusters are attached in the same way as the posts are. In an "open" stairway, the edges of the stairs are exposed. The stair treads themselves also often have what is called a return along the exposed edge. A return is essentially a bullnose edging that runs along both the front edge and along one side of the tread, giving it a uniform, finished look. 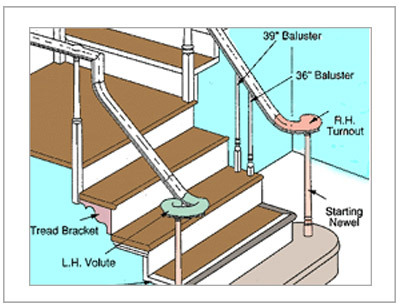 In a closed stairway, the stair treads end flush against the wall, with no edge exposed to view. This may be the case for a stairway that truly has walls running up both sides, or for a stair that is open to one side, but with a very low wall built up to make the edges of the treads. Sometimes you see a starting step, as seen left. This is an extra large first step that sets out from the rest of the stair, giving the whole an elegant feel. POST TO POST: This is an example of a Post to post system. It gets it name from the fact that the railing attaches to the posts alongside them. The baluster system may be of either sort. The most common choice of baluster system with this style, though, is a square top baluster. The post to post system is generally easier and faster to install, and so the baluster system that is also faster and easier to install is often found alongside it. There are only relatively simple miters to cut, rather than the more intricate cuts required to blend the rails and angles together with the over the post system. A Baluster with a dowel end: This is made to be attached to the railing by drilling a hole into the rail, and glueing the baluster in place. It is not appreciable stronger or weaker than the other style, and is primarily an option that allows for a more delicate looking baluster system, with a narrow top. Baluster and fillet: This system attaches a square topped baluster to the railing by toenailing, and then filling the gaps between balusters with a small strip of wood known as a fillet. The baluster sets into a groove milled into the bottom of the rail, and the fillets are precut to that same width, often by the manufacturer. The railing used in this system is called "plowed", as it has the look that its underside has been plowed out to receive the balusters and fillets. OAK: Oak is perhaps the most popular choice in wooden stairway systems. It is very durable, continues to stand the tests of time, and looks fabulous. As a result, it is the wood that is produced in larger quantities. This means that it is usually the case that a particular style might be in stock, and readily available. It is not a good short-term cost saving option, but it is a good choice for the long term, and can make a stunning centerpeice to an entryway, or make any home a touch more elegant. BEECH: Beech is one of the top three options for stairway woods. It has a tight grain that takes stain reltively evenly. It is rather durable, though not as much as oak or the other hardwoods. It also takes paints well, on the off chance you don't wish to use a stain. Its cost is lower than the hardwoods, though ont the lowest of all the options. MAPLE: Maple is a hardwood that has a distinct character to its grain. It is not unusual to find kitchens with maple cabinets, nor is it difficult to find maple with nothing but a clear coat on it, to let its natural beauty shine through. With age, the character of the maple only improves. This is more of a custom option, and so we have to special order all of the stair parts. There is a waiting period of several weeks for most parts. Some find the wait well worth it. CHERRY: Hickory is the final option for a hardwood stairway. It has more character to its grain than the birch, and does not have the reddish tint of the cherry. Rather, it bears a coloring similar to the oak, but with a very different grain from the often-recognized oak. It is in the same cost bracket as the cherry or the maple, and has the same lag time for deilvery of parts. Kitchen cabinets made of hickory can easily be found (including in our showroom! ), and it is this that draws people to look into installing a hickory stairway. 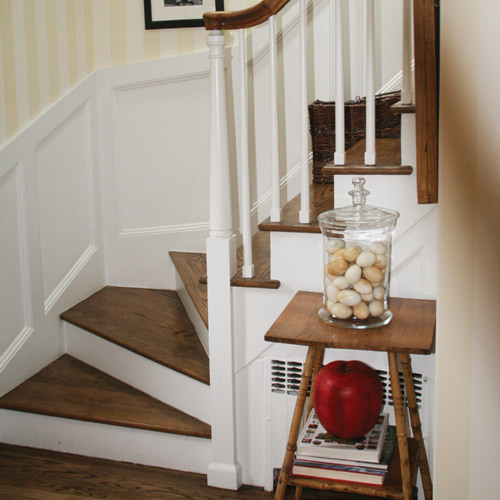 PRIMED: Primed stair parts are easily the most cost effective. They are made of a "paint grade" wood, which is often poplar. What this means is that the wood has a smooth grain, but often is discolored for some reason, making it unlikely to be used with only a stain, where blemishes would be obvious. The primed stair parts are generally in stock and ship quickly. Once installed, they accept paint readily, and can give a nice accent to the room.